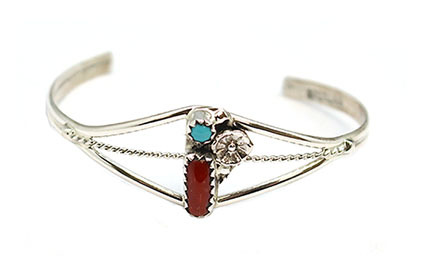 Sterling silver split and twist wire shank with a free form coral and dot turquoise stone with a cast flower cup. Center measures approximately 5/8" wide and tapers. Wrist size measures approximately 4'' with 1'' opening. It is Navajo hand crafted by Esther White. Stone size and shape may vary. Wrist size measures approximately 4" with a 1" opening. Can be slightly adjustable.